i assume youre supposed to be like "ooooh, whats their story"
did he pick them ahead of you? are analysing it. it's quite funny. it also makes me feel stupid, because i look at it and just see a picture..
there is a lot to read into it actually, I can see that. Severn Bridge - Wales/popular suicide spot. Angel and devil teenagers - how the choices you make when you're young can shape your future in a simplistic way. So, it can be seen to be very Richey inspired. I like that they look like Manics fans too, are they real ones, do you reckon? It makes me all nostalgic. It's my favourite cover of theirs by far, definitely. that's basically all we did. Can you see those things though now? why? becuase i spent too long there, and on many occassions wondered whether The Humber Bridge could ever look nice! and i wondered for a split second whether that could well be it... it's not! Notice how the 'R's are reversed a la Bible too. But those girls look too young to be old skool manics fans, even from back in the day. <cynic>and there's no noticeable self mutilation scars</cynic>... oh I'm going to hell! or is that Hull. THEY USE THE HOLY BIBLE FONT AGAIN! oh yes, so it is! i can see how what you've said there also segues into the meaning of the title. on my mp3 player the other day! i'm not sure i can contemplate putting any of the others on though..
i was at the fox in lewisham last thursday, and the DJ mixed from the blood brothers into motown junk. it was hilarious..
in a "totally didn't see that one coming!" way. WE LIVE IN URBAN HELL! WE DESTROY ROCK AND ROOOOLLLLLLLLLL! You'd just have to edit a bit. are they trying to get their old fans back by being deliberately contraversial? 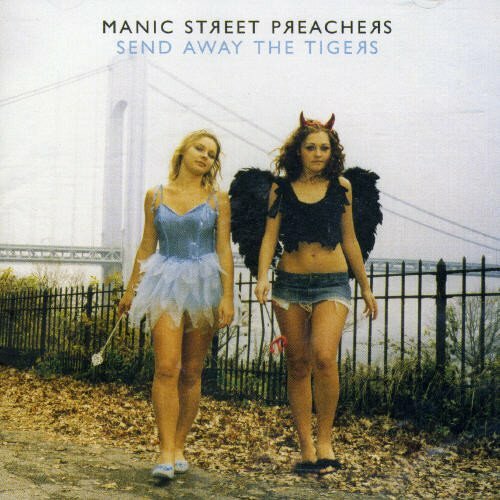 i used to love the manics for their attitude towards controversy, but i think half dressed underage girls? = bit rank. anyway, I dressed like that when I was a 15 year old Manics fan! they did that in 1994.
they've clearly decided that they cant be bothered impressing anyone other than their diehard fans anymore. not that those girls really look like manics fans. distinct lack of scars and badly applied makeup. think theyre dreadful now though...theyll never win me back. i'm not really a manics fan anymore. you're going to be banned from the Manics forums now. WTF r dey... or in proper parlance. What is the meaning of the anacronym "FMFs" please Mr Guntrip? they ripped off koRn in 1994? life is peachy > the holy bible. Maybe thats part of the theme of the album and the girls are the representation of the innocence. that quote is from the photographer David LaChapelle. That cover looks like something he might have done, actually. Except not as good. Whoever said the girls look photoshopped is right. The Manics did it because of the Russian, thing, though, surely? The reverse R is in the russian alphabet so synonymous with images from Socialist Russia. and partly because it's an allusion to an earlier record sleeve - Simple Minds' Empires and Dance. I can't stop thinking of that phrase when I see this cover,but I guess the severn bridge is significant. Who actually came up with this cover? to say it was Richy's last pic which he took and sent to Nicky to say "hahahaha I'm running off with these two groupies and leaving you to do the vacuuming you boring housewife. See that, that's the bridge, my car's right behind me, gonna leave it here and drive off in the devil-girl's dad's motor so you'll think i jumped and won't be able to find me again. innnnneh boyo"
not a bad cover. The bridge in the mist makes it. I hope the new stuff is decent, I'm seeing them in May. Was it Nicky Wire hiding in a bush?